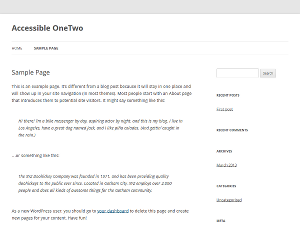 Quick summary: I made an accessible child theme for the default WordPress Twenty Twelve theme. Read on for details. There’s a good plugin by Joe Dolson called WP Accessibility but it seems to require jQuery and in any case, accessible websites shouldn’t need to rely on third-party plugins. There’s discussion of a WordPress “accessibility-ready” tag that theme authors would be able to use, assuming their theme fulfils certain criteria. Its status is currently Draft Proposal and people are encouraged to leave feedback. There’s a dedicated WordPress accessibility Twitter account (@WPAccessibility) and website (wp-accessible.org). Joseph Karr O’Connor has started a project called Cities to get more people collaborating on free accessible themes. There’s an accessible child theme for the former default WordPress theme, Twenty Eleven, by Rian Rietveld and she’s explained the enhancements she made. It was the write-up by Rian that helped me make a similar child theme for Twenty Twelve, the current default WordPress theme. Out of the box, it seems pretty good already and a big improvement over previous versions, but I felt there were a few tweaks that could be made. Below is a summary of what I’ve changed or overwritten. Force underline on links but remove links on hover/focus (to clearly indicate a selected element). Increase contrast in buttons, links and other text (for low-vision users and situations such as outdoors on a sunny day). Remove automatic hyphenation (to avoid strange pronunciation with screen readers). Remove link around the site’s title and banner image when front page is viewed. Only show the description heading if the site description has been set. Change headings in post lists from <h1> to <h2>. Add a “return to top of page” link in the footer. I’m not an accessibility expert but I think (hope!) these changes improve the browsing experience for all users. The theme itself is available for download from GitHub where I’d love to receive suggestions for improvements, or alternatively in the comments below. Incidentally it’s also been submitted to the WordPress theme repository as Accessible OneTwo so hopefully will be available to a wider audience in future. This entry was posted in Other and tagged accessibility, WordPress on 11 April, 2013 by Daniel. Nice work! I’ve been trying to find the time to collect together some people to add to the number of accessible themes in the repository. Hopefully I will be able to make the time after the next WordCamp I’m speaking at. I’m curious why you chose to remove links on hover/focus instead of preserving focus and even supplementing hover/focus with a stronger indicator? Thanks for the comment, Joe. Re. the underline removal, I think it’s a nice, clear indication of a hovered link that doesn’t rely on colour. I also don’t have great design skills so it’s easier for me to implement with confidence! Incidentally, I did try a colour-reversal effect on hover on a previous website but had feedback that it was a bit too strong and overbearing. As for focus, it doesn’t overwrite existing outline effects so the browser (or other user agent) will continue to use it’s own highlighting mechanism, such as a dotted border, etc. I’m open to suggestions, though, if you think there’s a more effective alternative. Hey, Daniel – thanks for doing this! I have to admit I haven’t had much of a chance to look at what you’ve done — but every improvement is worth while. You’re absolutely right that my WP Accessibility plug-in isn’t something any site should depend on — I describe it as the wrong solution to the problem — the right path for most of these issues is for the theme to do them right in the first place; but WP Accessibility fills in some of the gaps for those who don’t have the skill, budget, or time to make these changes to their theme. It’ll help, but it’s not the best way to do it. Sometimes it might just be the only way available. Thanks Joe – I agree with your comments. Although accessibility seems to be gaining traction in theme development, I think there’ll always be demand for plugins such as yours that provide extra flexibility. Nice work! This is great, building on each others work and sharing. You are right, there are way to few accessible WordPress themes. Thank you for commenting, Rian. I hadn’t heard of the Cities project so I’ve added it to the post — the more the merrier! How can I add an image next to the site name and slogan ? If I try to to add an image, it is placed automatically be low the menu with Home, . I start my next project using Twenty Twelve as a parent theme, I will use your child theme and do some modification so will fit with my desire. I little bit got some problem to show the related post with thumbnail picture and excerpt without using plugin below the post. Perhaps you know how to do it, do you mind to share your trick. It will be helpful for me to complete the project.